Level 2-DK is the eighth level of Donkey Kong Jungle in Mario vs. Donkey Kong. The high score for this level is 23000. The objective is to defeat Donkey Kong, and the level begins immediately after the completion of Level 2-mm. Donkey Kong is on a moving platform below the player. 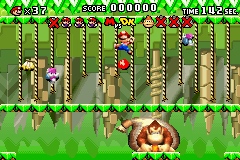 To attack him, the player has to knock down fruit that is floating between the ropes. After attacking him the first time, Donkey Kong will start moving faster and toss up Snapjaws, which can be defeated by dropping fruit on them or by waiting a certain amount of time. Getting hit by a Snapjaw will also instantaneously make all Snapjaws disappear. Donkey Kong will also start moving erratically, often heading back the way he came before making it to the other side of the stage. Every time Donkey Kong is attacked, he will move faster and toss up more Snapjaws. Once Donkey Kong is attacked four times, he will leave and the player will move on to Level 3-1. This page was last edited on April 14, 2019, at 15:44.